All of the yarn for my Cast On projects has arrived. I spent a lot of item getting the yarn to the other designers. It can take multiple emails and lots of follow up emails. I think one designer (in Canada) has not got her yarn yet but she should have it soon. George and Petipa tolerated each other a few days ago to enjoy a rare spot of sun. I didn't get many lessons to review this week. It has been fairly slow. I did get several new students, however. I'm thinking of changing my policy for non-US students. Postage has got so expensive. What Naima, my French student suggested was to hold of mailing the swatches back until the course was complete. We do add a bit onto the cost of the course for non-US but it doesn't really cover the postage costs. I'll keep you posted. This week's tip, again, is self serving. The designs Binka and I are doing both require stitches to be cast on at the beginning and end of a row so I decided to do a video on how to do this. 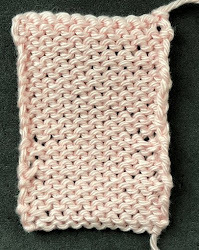 The most common reason for this technique is adding stitches when a thumb gusset is complete. I rarely add stitches for this as any method you use adds too much space. I generally just work from one side of the opening to the other and then use the slack yarn between them on the next row to create loops for the stitches on the next round. When knitting flat this isn't an option; stitches have to be cast on at the end and beginning of the rows. No matter what technique you use, the cast on edge is going to be either sloppy or a bit bulky. The good news is that in the majority of projects, this cast on edge is either going to be seamed or used for stitch pick up so its appearance doesn't matter. This is the most common method. I'm not going to discuss HOW to do this (the video shows how to do it) but rather the results. Anyone who has ever used this method knows that you get a lot of slack yarn between the stitches as you work the first row no matter how tight the loops are (that just makes it harder to work that first row). The photograph below shows this method. The advantage of this method is that it is easy and it isn't bulky. The disadvantage of this method is that loops can be very sloppy and oversized. It won't provide much stability to the edge. Notice how large the selvedge stitches are at the join. Again, this edge is generally finished so it won't be noticeable. Another method you can try is the knitted cast on. It provided a bit more support to the edge but it is still fairly sloppy. It is easier to work the first row with this method than the E cast on. This technique produces the best looking and most firm edge. This is the method used for horizontal buttonholes for that reason. Salon will be on Saturday from 2:30 to 4:30 this week. I realize that this will conflict with the game (if you are coming you know what game I am talking about) but I am driving to the airport on Sunday. While waiting for the Cast On yarn to arrive, I knit another texting glove. I made a pair earlier but I decided I wanted the fingers to be as long as my fingers. This way they won't get cold but I can push down the glove fingers if I want to type. By the way, Maris, I do plan to write this up as a pattern once I finish up my Cast On patterns. I'm doing a vest and skirt in Shibui Rain (the color is Pollen which seems a perfect choice for Spring). I've finished the body, I just need to do the bands. The stitches on the neckline will be picked up first and then a wide band with mitred corners for the front and bottom bands. Stay tuned for the completed project. Doesn't look like much now. You can see in this side view that the back is longer than the front and the sides are vented. I'm using Baah yarn for the next sweater I am doing and when I talked to Mira, the dyer, at TNNA I was wearing the Decoration Day sweater I designed years ago. Mira said she'd love a stranded project and I told her if she sent me the yarn I'd work something up. She sent two different types of yarns. I'll work on this when I finish the stuff for Cast On.